Amazing pool, amazing room, amazing people! Stayed here to go to Fresh Island and it was perfect! the pool was awesome and the gent that hosted us made us feel welcome. Krásný apartmán, mám radši tvrdší postele a postel mi absolutně vyhovovala, super velký balkon k apartmánu, bezvadná malá kuchyňka s myčkou. Apartmán byl podle mě úplně nově vkusně zrekonstruovaný, čistota a zařízení koupelny se záchodem na nejlepší úrovni!! Bazén s výřivkou jeden sen! A celá poolarena absolutně super! Vše krásně opečovaný, pohodlný lehátka dostatečně k dispozici. Einzig und alleine das Pool war in Ordnung, welches jedoch über Straße bei einem "Nebenhotel" liegt! Lock in a great price for City Pool Apartments Novalja – rated 8.5 by recent guests! City Pool Apartments Novalja This rating is a reflection of how the property compares to the industry standard when it comes to price, facilities and services available. It's based on a self-evaluation by the property. Use this rating to help choose your stay! 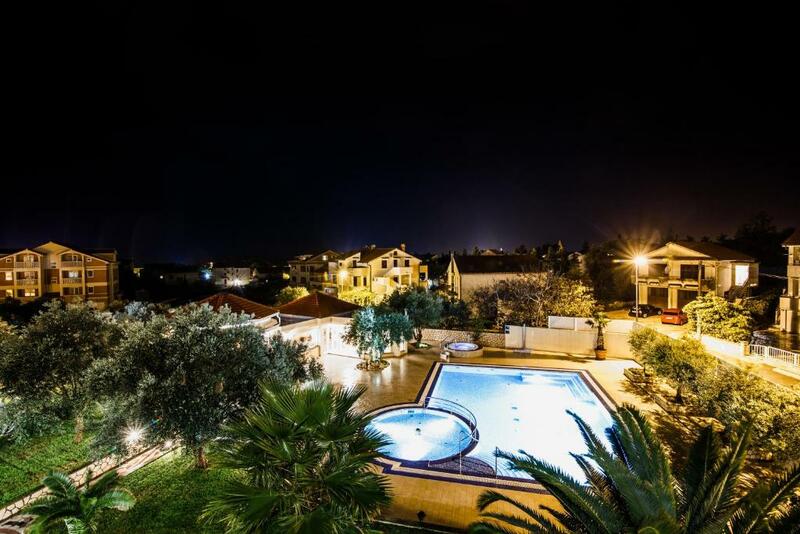 One of our top picks in Novalja.Offering a seasonal outdoor pool and hot tub, City Pool Apartments Novalja is located in Novalja. Free WiFi is provided . All units feature a flat-screen TV. Some units have a seating area and/or balcony. All units include a kitchen fitted with a fridge and stovetop. Free private parking is also available at this apartment. Towels are featured. The nearest airport is Zadar Airport, 39 mi from the property. This property is also rated for the best value in Novalja! Guests are getting more for their money when compared to other properties in this city. 뀐 Located in the top-rated area in Novalja, this property has an excellent location score of 8.6! When would you like to stay at City Pool Apartments Novalja? This apartment has a stovetop, tea/coffee maker and kitchen. This apartment features a private pool, air conditioning and balcony. This apartment has air conditioning, kitchen and stovetop. This apartment features a seating area, stovetop and private pool. We are a travel agency located in Novalja on the beautiful island of Pag in Croatia. Our agency has a tradition in tourism and it has always been our goal to make sure that the guests leave our small but beautiful town satisfied and with wonderful experience. We offer a wide range of apartments for which we are sure will please all of your wishes. House Rules City Pool Apartments Novalja takes special requests – add in the next step! City Pool Apartments Novalja accepts these cards and reserves the right to temporarily hold an amount prior to arrival. A damage deposit of EUR 180 is required upon arrival – that's about 202.38USD. This deposit is fully refundable at check-out as long as there's been no damage to the property. Please inform City Pool Apartments Novalja of your expected arrival time in advance. You can use the Special Requests box when booking, or contact the property directly using the contact details in your confirmation. description of the room itself wasn't great. apartment was very small. no oven which was an issue as we expected one and had brought loads of oven food that went to waste.